A coalition of San Francisco organizations long-opposed to the construction of a 10-story, 380-unit building at the 16th and Mission BART plaza by Maximus Development met last week to present alternatives for the space including a popular option to downsize the proposed development to a four-story, 150-unit building. 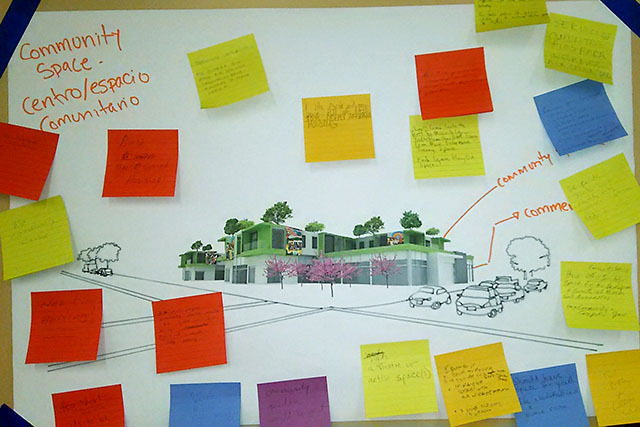 The coalition’s three proposals include a single-story commercial space with some green space and an urban farm on top, a two-story construction with commercial spaces on the ground floor and a community center on top, and a four-story project with some 150 units of housing on top, retail in the ground floor, and some green space. Among the 30 or so attendees at the Saturday meeting, the four-story development appeared most popular. 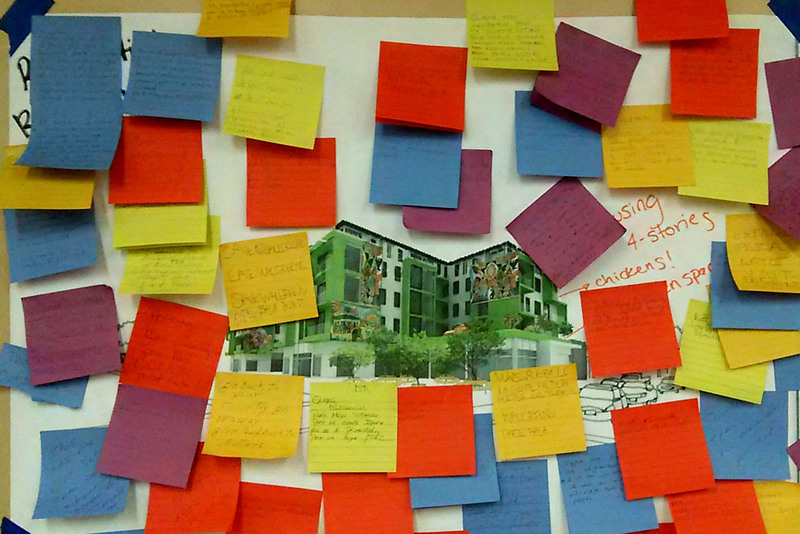 Organizers had distributed adhesive notes for commenters to leave feedback on, and the proposal that included housing attracted the most responses. Many called for even more housing. “The city is running out of land. So if we can get something to fit more people that has to be the priority,” said Faustino Valenzuela, a Causa Justa member. “I would add two more stories of housing on top,” said Hillary Ronen, a candidate for District 9 supervisor, in a small group discussion. The six or so women around her nodded. But those at the meeting also hoped this housing would be affordable. It’s unclear what will happen to any of the proposals as the landowner and developer are locked in a lawsuit and the project is at a standstill, but that has not stopped the opposition from coming up with alternatives. “I just think that we need 100 percent deeply affordable housing. With teachers at the maximum, and homeless at the lowest [income levels],” said Jordan Gwendolyn Davis. Iswari España, another candidate for District 9 supervisor, also echoed the need for housing, but emphasized the need for housing that could accommodate families. Still, organizers anticipated — and sometimes got — differences in priorities among the community. “There will be disagreement. We’ll figure out some more of that process of how we will struggle with each other,” Zamudio said. Oscar Varela, who previously advocated for more housing and called the shorter developments a “waste of money,” changed his position slightly when he learned the development was for the corner of 16th and Mission. When he found out that it would displace a Walgreens drugstore, he worried that people employed by the store would lose their jobs and that families in the area would lose a valuable resource. “Right now there’s a lot of families with kids at Walgreens,” he said. 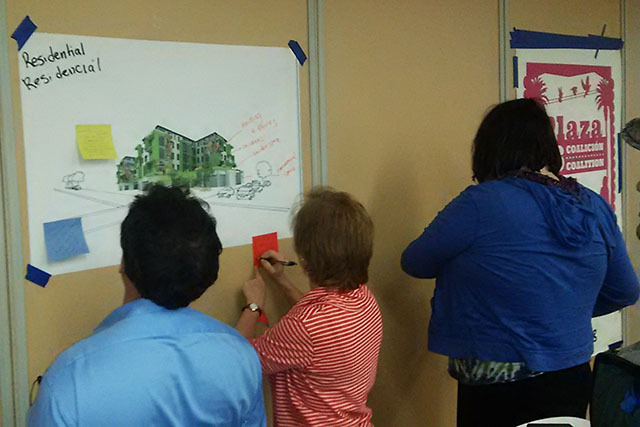 Opinions also varied about how the community spaces should be used. Several community members pressed for additional youth recreation space, while others said they would prefer to see visual and performing arts spaces. Some wanted outdoor green space or recreation space, while others said the Mission has enough parks. “We don’t need more green space, because we have lots of parks for recreation,” said one note. “Please no more ugly box,” said another, referring to the multi-level, square exterior design favored by new developments. 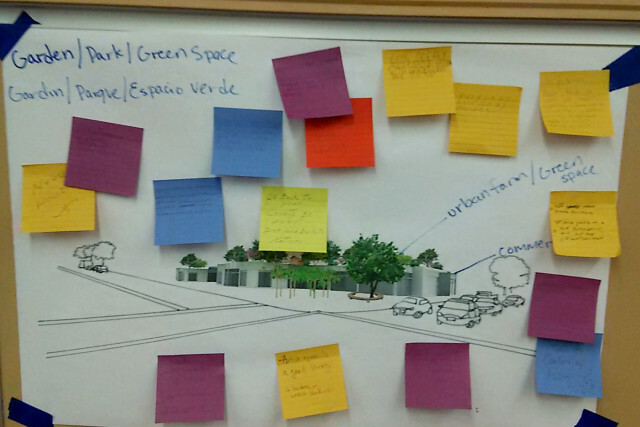 In his small group discussion, Valenzuela wished for parking underneath a multi-unit structure. “We’ve got the meter maids chasing us all day like the fisherman is chasing the tuna fish,” he said. He also advocated for public restrooms on the plaza, and a park on the roof. España also pointed out the need among displaced small businesses for a place to go. “It could be a support for small business. A lot of our small businesses are suffering, and there’s no clause that protects them unless they are more than 20 years old,” he said, referring to a fund put in place by last year’s vote that is designed to protect legacy businesses. Plaza 16 organizers have been brainstorming alternatives to the current proposals for more than a year, said Causa Justa organizer Maria Zamudio in a presentation to Plaza 16 members gathered at CCSF’s Mission Campus on Saturday. An architecture student volunteered her time to draw up three alternative visualizations for the space, presented for the first time at Saturday’s meeting. Proposal with commercial and green space mixed. Proposal with commercial space and a community center on top. Proposal with a commercial floor and residential on top. For now, however the visualizations are just that. Plaza 16 organizers acknowledged that they do not own the land, a major hurdle that would still need to be addressed if their proposals were to be made a reality. Coalition organizers will take the feedback into account and develop new proposals at a future meeting. How about Mission folks and San Francisco residents make decisions about our neighborhoods and Maria Zamudio, who lives in Oakland, can leave us alone? She and other “community organizers” from Plaza 16 and Mission Inc are part of the problem, anti-democratic and limited in their vision. Please, folks from the East Bay, stop telling us what actual San Franciscans want. No wonder new units cost $1 million. Developers have to deal with hundreds of self-proclaimed architects, some who want taller, some who want shorter, etc. Also, things like the urban garden, etc. don’t come for free–they’re tacked on to the cost of the unit. For housing to be truly affordable, there are going to have to be areas of the city designated as reduced-restriction build zones. Maybe 16th and Mission isn’t the place for this, but some of the older industrial areas could be. Someplace where the permitting and development process is accelerated in exchange for more affordable housing.